Kick back in our newly renovated service lounge and enjoy complimentary Wifi, gourmet coffee and snacks and even HD TV. Our complimentary shuttle service runs every half hour and allows you to schedule pickups within 20 miles from our store. Better yet, if your service lasts longer than 2 hours, we’ll give you a complimentary loaner car for the day! All types of credit, from good to bad, can qualify for an auto loan. No credit, no problem! We will work with you to secure a no credit car loan if your situation demands it. 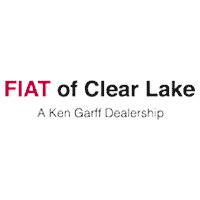 FIAT of Clear Lake has strong relationships with its vendors and customers and our finance staff is committed to finding you the perfect car loan company to suit your car finance needs. Welcome to FIAT of Clear Lake, your local Texas FIAT dealership helping drivers from the Houston, Webster, Pearland, Pasadena, League City, Texas City, Sugar Land, and Baytown areas. At our showroom located in Webster, TX we offer a broad range of new FIAT, as well as a finance, parts, and service center at our dealership. You can explore our website’s inventory of new and used cars to find the vehicle you’ve been searching for, and contact our FIAT dealership when you are ready to set up a test drive or sign on the dotted line! Here at FIAT of Clear Lake we are committed to giving our drivers a luxury experience each and every time, and we look forward to serving you! Our FIAT dealership is excited to get you in the driver’s seat of a new 2018 FIAT 500, 2018 FIAT 500c, 2018 FIAT 500X, 2018 FIAT 500L or a 2018 Spider 124 and our new FIAT inventory is ready to hit those Houston streets. No matter what type of vehicle you may be interested in, whether it’s a larger model that has plenty of cargo room, or a new FIAT convertible that has a smooth design, or maybe you’re looking for that sporty ride for weekend driving. In either case, our Houston, TX dealership has exactly the cars you are searching for. Shop our online inventory and remember to see what new car specials our dealership is currently offering, as well as our current special incentives. At our FIAT dealership near Houston, we’re excited to put you in the driver’s seat to begin the next chapter of our celebrated legacy. Allow us to demonstrate our commitment to exceptional customer service! FIAT of Clear Lake specialists are here to answer your questions about the FIAT 500. Stop by today or call us at (888) 591-4117!